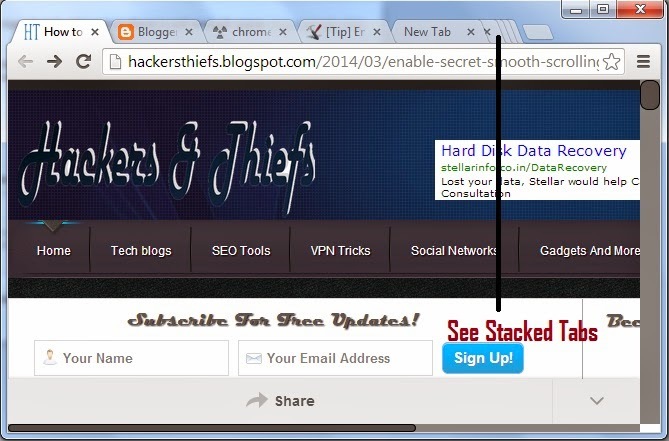 Today, I will show you how to enable hidden secret stacked tabs feature in your Google Chrome browser. 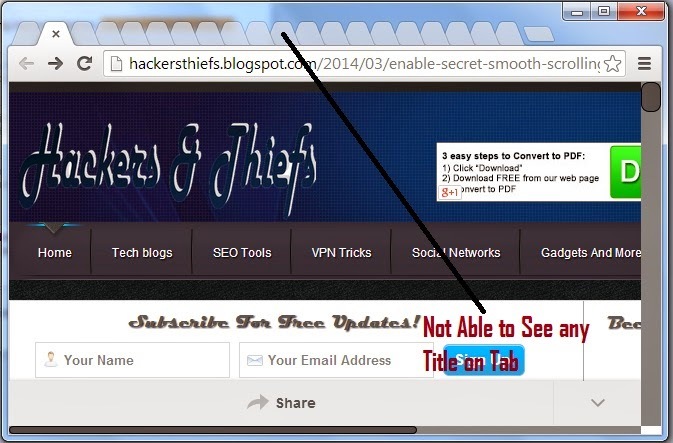 It's very interesting trick and it might help you in using Chrome in better way. You know I use Google Chrome as my default browser as there are so many innovative features in this browsers. But I also use Mozilla Firefox, Opera, Internet Safari and Internet Explorer for the testing purposes. Today when was sharing a post on Smooth Scrolling on Chrome browser, I found a stacked tab feature that is not enabled by default for normal users. I found this trick very interesting and so I am sharing this secret trick to you. Did you notice that when you open too many tabs in Google Chrome than all the tabs in the browser starts to shrink and a stage comes when only the cross(x) button is displayed to fit the screen width. Now in this case it can be very irritating to browse the tab as you will not able to see the title above the tab and you will have to click on each and every tab to see if it's the tab or page you're looking for (in your browser). See the image given below to understand what I am talking about. In other browsers like Firefox the tabs don't get shrink up-to this label. They get shrink up-to the minimum width and when you open new tab than it get stacked to the right corner. If you also face difficulty on shrinking the tab than follow the steps given below to enable hidden and secret stacked tabs features in Google Chrome browser without the use of any extension. First of all go the experimental feature tab of Chrome. To go to this tab than just type "chrome://flags" in your Google Chrome browsers URL bar and press enter. Now you'll be on experimental features tab of your Google Chrome browser. Now look for the title that says Stacked Tabs. If you're facing difficulty in finding this feature on experimental feature tab than just press CTRL+F to open the search box and than type Stacked Tabs in the search box and hit enter. Now you'll see the para something like the below given image. To enable the Stacked Tabs feature click on the enable button below the title. After enabling this secret hidden trick that offers stacking of tabs in Google Chrome browser you'll need to relaunch the browser. To relaunch the browser click on the relaunch now button located on the left bottom side of the page. Now, after relaunching the Google Chrome browser the new feature will be enabled for you. Now you can enjoy the new stacked tabs feature in your browser. 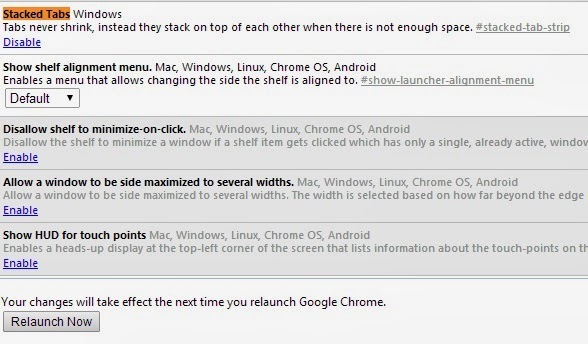 I shared this tip to you as I found this trick interesting and I felt it can be very useful for the Chrome users. If you need any assistance than feel free to comment. I am sure you'll not face any difficulties in navigating the tabs. If this tricks helped you in any way than you'll also like to share it to your friends by using the below social sharing buttons. For more interesting tricks keep visiting this site.